In May 2000, barriers suddenly appeared around the well-loved but neglected Piccadilly Gardens, with signs saying "Construction Site Keep Out", and notices about the closure of pathways. 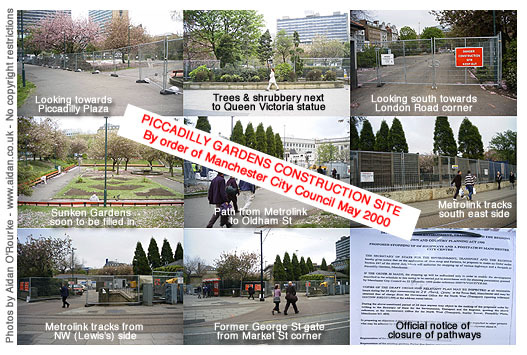 The instigators of this construction work, Manchester City Council, posted no photographs or artists impressions of how their construction project will look when it's finished. Is this the demise of Piccadilly as we know it? Keep visiting Eyewitness in Manchester to see how this scene looks in a couple of month's time. We are at the end of Deansgate looking across to the construction site named Shambles West, even though the two medieval pubs known as The Shambles have been removed from this location. Beyond the construction site is the new Marks and Spencer building. To its right is the Royal Exchange building, on St Mary's Gate, the street which meets Deansgate on the far right of the picture. On the far left are the Britannic Buildings, and to their right, the CIS building. Soon, a new development will rise up in front of us. In Spring 2000 the details of the design haven't been fully publicised, but there is concern that the tower block will be out of proportion with the neighbouring buildings. Few people are aware that on this once triangular block stood the magnificent Victoria Buildings, a shopping, office and hotel complex opened in the 1880's. It was damaged by incendiary bombs during the 1940 blitz and was subsequently torn down. Eyewitness in Manchester says: Reconstruct the Victoria Buildings! If they can do it in Germany and Poland, why not here? 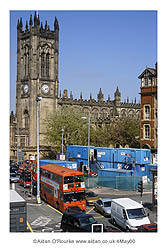 From the elevated ramp at the bottom of Deansgate we can see Manchester Cathedral. There's traffic congestion in both directions, as usual, made worse by the redevelopment work going on all around. The blue portakabins have been put up as part of the redevelopment of this group of buildings, dubbed Manchester's 'medieval quarter'. Though this area was once the heart of Manchester in medieval times, none of the buildings date from that period, apart from a few portions of the Cathedral. The term 'Medieval Quarter' is therefore highly misleading and shouldn't be used. Perhaps this area should be called the "Cathedral Quarter". We are in St Mary's Parsonage, off Deansgate. A church once stood on this spot. 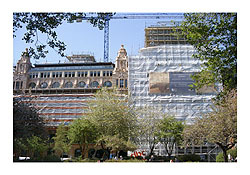 On the left are the National Buildings, built in 1905, with the 1960's extension on the right now covered in scaffolding. When completed, this will be one of the most prestigious residential developments in Manchester city centre. According to the 1999 MEN advert, prices are in the range from £110,000 to £1,000,000. Unil recently, these were the offices of National Vulcan. This development is one of the most striking examples of the transformation of Manchester city centre from a nine to five office environment to a place where people live and play, as well as work. We are standing on Trinity Bridge, looking along the River Irwell towards Manchester Cathedral. To the right we see the rear facade of the National Buildings, St Mary's Parsonage, currently being converted into prestige apartments. Balconies have been added, with views over the river, and Salford beyond. 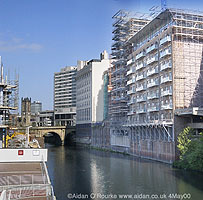 The higher, narrower section in the centre, covered in scaffolding is the 1960's extension. At the top of this section will be a penthouse apartment which will be one of the most expensive in Manchester. Across the river to the left, on the Salford side, a new hotel is under construction. We are standing on the Manchester side of the award-winning Trinity Bridge, also known as Calatrava Bridge, after its designer. In Spring 2000, resurfacing work is in progress on the bridge. On the far left is the Inland Revenue building, and next to it, a new hotel is under construction, with a distinctive curved shape. On the far right we can just see Blackfriars Bridge, and rising above it, Highland House. This is the view from the steps the old entrance of Manchester Crown Courts, overlooking Crown Square. Across the square is a large complex of office buildings constructed in the 1970's. Like most buildings from that time, they are functional, drab and uninspiring. They house the offices of Manchester City Council education department, as well as the Manchester Evening News. As part of the Spinningfields Development, proposed by Allied London Properties, with the support of Manchester City Council, all the buildings we see here, including the office block on the left, will be demolished to make way for a new, large scale development, the biggest outside the bomb-damaged area. 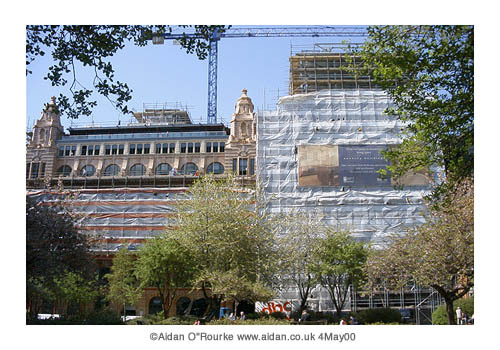 Manchester Crown Courts, as well as the John Rylands Library and a few other buildings, will be retained. Check back in five and ten years time to see the view from this spot. Here is Northcliffe House, one of the UK's most striiking examples of American-style 1930's art deco architecture. As part of the Spinningfields Development, drawn up in early 2000 by Allied London properties, this building will be demolished to make way for a five star hotel of mediocre design. For nearly seventy years, this rocket-shaped tower has stood out as one of the city's most unusual landmarks, a futuristic dream from the long-lost 1920's. How much longer will it be before demolition time comes? Check back in the months to come to witness the destruction of Northcliffe House. In early 2000, the former Hospital for Skin Diseases opened on Quay Street in 1906, is becoming a forgotten memory. It was abruptly demolished in late 1999 to make way for a new office development, construction of which has already commenced. 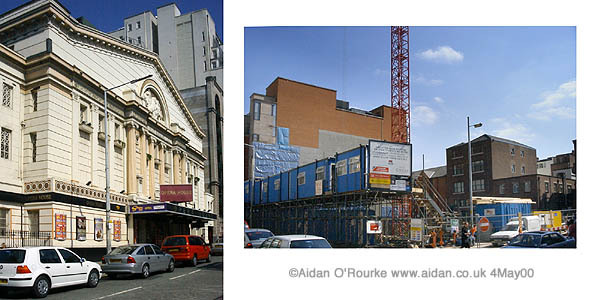 It stood opposite the Opera House, which itself was once threatened with demolition but thankfully saved. 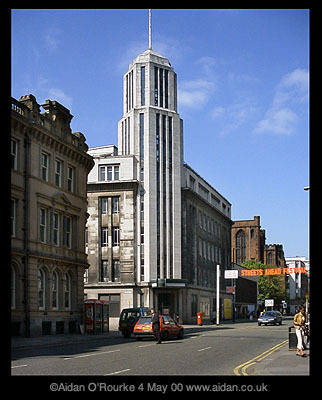 A remarkable lack of care for Manchester's architectural legacy is a feature of Manchester City Council's post-war redevelopment policy. The destruction goes on in 2000, just as it did in the 1960's and 70's.